Who doesn’t love a good crispy chicken strip? Perfect as an appetizer or snack for the big game, or even as a main course with a salad on the side for dinner! In a shallow bowl, whisk eggs. In a separate bowl, whisk flour and mustard together. In a freezer bag, pour rice cereal and mash with hands or the back of a frying pan until the cereal forms rough crumbs. Dip chicken first in flour mixture, then in egg. Shake gently to remove excess. 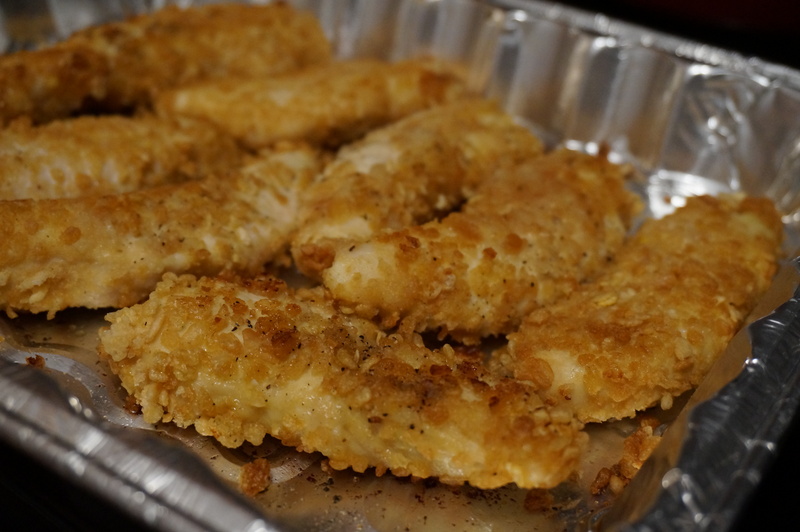 Add chicken, a few strips at a time, to cereal in the bag. Shake, shake, shake, until evenly coated! Remove from bag and place on a foil-lined baking dish or aluminum foil pan. Drizzle with a bit of olive oil and sprinkle with salt and pepper. Bake at 400 degrees for 20 minutes, turning chicken halfway through. Chicken will have formed a nice crispy crust!